More than nine years ago, when terrorists opened fire at Nariman House, it was a miraculous escape for two-year-old ‘Baby Moshe’ who was rescued by her Indian nanny Sandra Samuel. 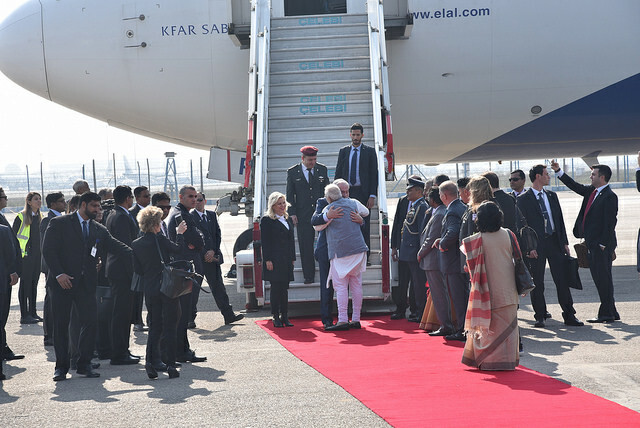 He has, since then, come to represent a story of tragedy, love and hope, marking an emotional connect between India and Israel. 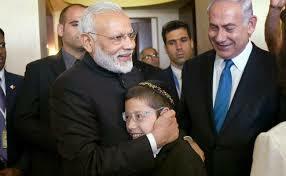 It was a moment of joy when the Jewish Chabad House, popularly known as Nariman House, hosted Israeli Prime Minister Benjamin Netanyahu and eleven-year-old Moshe Holtzberg for the unveiling of a state-of-the-art Living Memorial to commemorate the victims of the 26/11 Mumbai terror mayhem. “What happened here represents the polar opposites of love and hate, the hatred perpetrated by the terrorists, but it also expressed tremendous love. The love of your parents Gabi and Rivky to you Moshe, and the love that is expressed by the Chabad House here in Mumbai and the love that is expressed by the embracing and loving attitude of the Chabad emissaries around the world which embraces and provides a loving home for every Jew around the world,” Mr Netanyahu told Moshe, who was accompanied by his paternal grandparents, Nachman Holtzberg and Frieda Holtzberg, maternal grandparents, Shimon Rosenberg and Yehudit Rosenberg, and uncle Moshe Holtzberg. His Indian nanny, who was awarded the title of ‘Righteous Gentile’ by Israel as the highest award presented to non-Jews, was also present at the occasion. Moshe, who now lives with his grandparents in the Israeli city of Afula, also read out a welcome speech for the Israeli prime minister. Still bearing the bullet marks, Nariman House was where Moshe’s parents Rabbi Gavriel and Rivka Holtzberg lived. 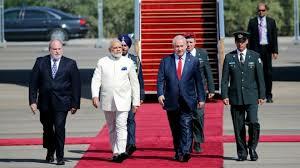 Underlining the civilizational and democratic connects between India and Israel, Benjamin Netanyahu, in his speech at the third edition of the Raisina Dialogue talked about the need to build power in an increasingly insecure world.“The weak don’t survive. The strong survive. You make peace with the strong. You ally with the strong”, he said like a true realist. The Israeli leader outlined four types of power- military, economic, political and the power of values- that democracies like India and Israel should focus on. Therefore, building submarines, cyber capabilities, science and technology, interceptors are an essential component of the developmental goals. India-Israel economic relations are poised for a decisive transformation, with the fusion of India’s size and scale with Israel’s sharpness and edge.Pitching economic ties onto a higher trajectory, India and Israel jointly launched the ‘I4Fund Call for Proposal’ website as part of the maiden call for the joint research and development (R&D) initiative. Under this $40 million fund, both sides will pursue technological innovations in areas such as water, agriculture, energy and digital technologies and create a support structure to convert “know-how” into “show-how”. 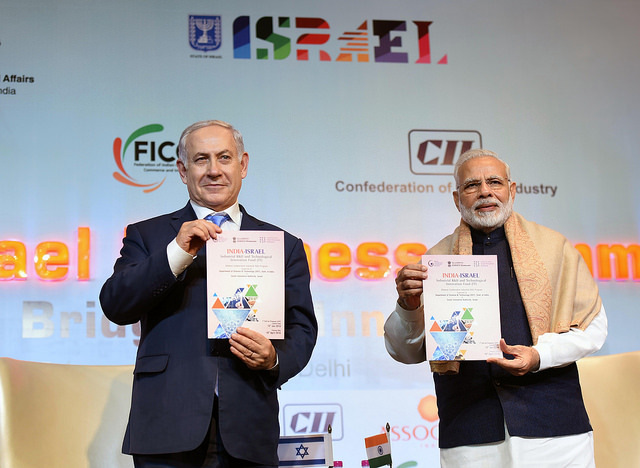 Speaking at the India-Israel Business Summit in New Delhi, which included 100 delegates from 74 Israeli companies, India’s Prime Minister Narendra Modi praised Israel’s “remarkable spirit of innovation, enterprise and perseverance” and underlined the shared commitment to connect the talent pool of both sides towards achieving path-breaking technological advances. 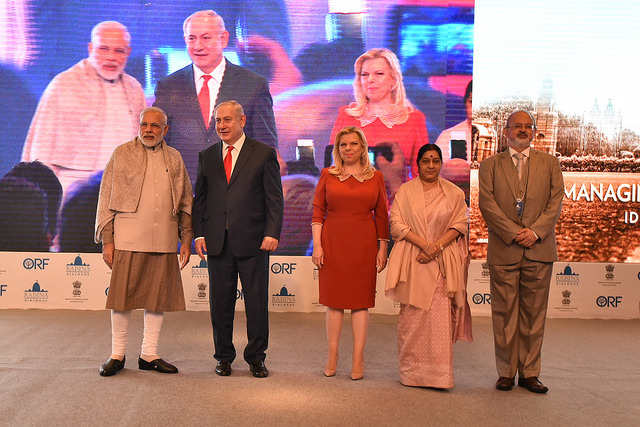 Moving beyond intricate chessboard of geopolitics in West Asia, India and Israel are set to fashion a robust partnership of the future, revolving around technology and innovation during Israeli Prime Minister Benjamin Netanyahu’s maiden trip to the Asian country. Days before Mr Netanyahu’s visit, India had voted against the unilateral declaration of Jerusalem by the US in the UN, triggering speculation about New Delhi’s commitment to taking the India-Israeli relationship forward. 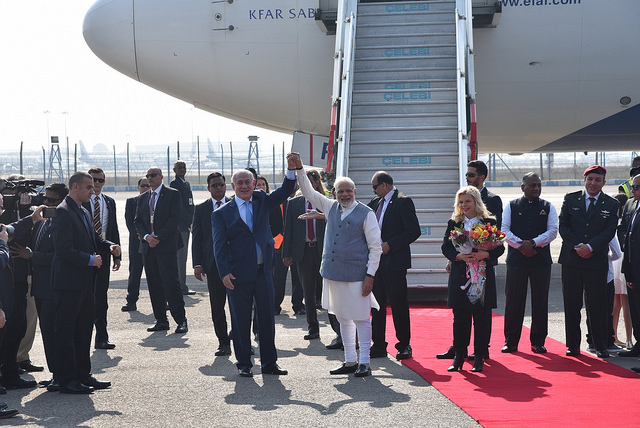 Now these apprehensions have been dispelled as the Israeli leader began his six-day visit to India on January 14, with Prime Minister Narendra Modi personally receiving his “friend” at the airport. Ahead of his visit, Mr Netanyahu had clarified that although he was disappointed, one vote won’t affect this relationship of the future. 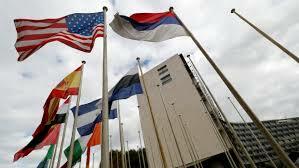 Citing anti-Israel bias, mounting arrears and a need for fundamental reforms, the Unites States has decided to quit the United Nations Educational, Scientific and Cultural Organisation (UNESCO) by end of this year, marking yet another withdrawal from world organisations by the Trump administration. 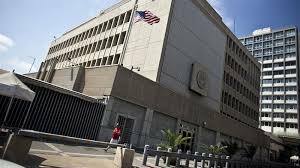 US spokesperson Heather Nauert said in a statement: “This decision was not taken lightly, and reflects US concerns with mounting arrears at UNESCO, the need for fundamental reform in the organisation, and continuing anti-Israel bias at UNESCO.” The US will, however, remain engaged with the organisation it helped set up the UNESCO in 1945 as a non-member observer state. The Prime Minister Narendra Modi presented Prime Minister of Israel Mr. Benjamin Netanyahu replicas of 2 sets of relics from Kerala that are regarded as key artifacts in the long Jewish history in India. They comprise two different sets of copper plates that are believed to have been inscribed in 9-10th century C.E. The first set of copper plates is a cherished relic for the Cochini Jews in India. It is regarded as a charter describing the grant of hereditary royal privileges and prerogatives by the Hindu King, Cheraman Perumal (often identified as Bhaskara Ravi Varma) to the Jewish leader Joseph Rabban. According to traditional Jewish accounts, Joseph Rabban was later crowned as the Prince of Shingli, a place in or equated with Cranganore. Cranganore is where Jews enjoyed religious and cultural autonomy for centuries, before they moved to Cochin and other places in Malabar. Local Jews once placed in each coffin a handful of earth from Shingli/Cranganore that was remembered as a holy place & a “second Jerusalem”. The replica of these plates was made possible with the cooperation of the Paradesi Synagogue in Mattancherry, Kochi. Can the US and Iran join hands to fight the IS?